The lovely and athletic Cooper’s Hawk has been prized by falconers for years. These lovely raptors also live in the wild and many enthusiasts enjoy watching them hunt in their natural habitats. The call of a Cooper’s Hawk is a repeated “kak-kak” sound. These birds are swift fliers with strong, powerful wing beats. Although they may sometimes take lizards, insects or mammals like chipmunks or squirrels, their speed best suits them to catching songbirds or other birds such as meadow larks, robins and starlings. In captivity, they are generally used to hunt hares, rabbits and sometimes pheasants. Cooper’s Hawks hunt by flying low and fast over thickets or woods. They will circle above birds before pursuing them. For mammals, they will wait on an obscured perch until prey is far from protective cover before giving chase. Cooper’s Hawks are renowned for their determination and aggression as hunters and have even been known to take to the ground and follow prey into bushes. The natural habitat of the Cooper’s Hawk is a mature, deciduous wooded area. They have occasionally been seen in wooded suburban areas and the edges of the forests they prefer. Although Cooper’s Hawks will roost in coniferous trees, it is very rare that they will nest there. In the winter, these hawks migrate south with other hawks. Usually they have returned to the northern regions of their range by March. The general coloration of a Cooper’s Hawk is slate blue. Its crown tends to be a darker shade and its back a bit lighter. The entire underside is white and may have rufous barring. The tail has a white band around the edge and is rounded. Cooper’s Hawks have very lean, long bodies and red eyes. In juveniles, the eyes are a more yellow-orange color and the feathering is brown. The undersides have white and brown streaks. 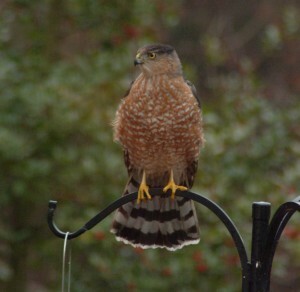 At maturity, a Cooper’s Hawk is about 14 to 20 inches in length and has a 28 to 30 inch wingspan. Their heads have a squared off shape. 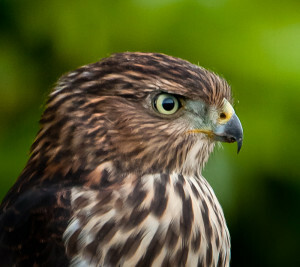 Cooper’s Hawks are native to southern Canada and the United States, but have been reported as far south as Costa Rica during southern winter migrations. In the past, Cooper’s Hawks have been known to steal chickens. They are protected by federal law in the United States. Cooper’s Hawks may be a bit high-strung in captivity and are best suited to experienced falconers. General and Master Class falconers are probably the correct skill levels for these hawks. They are determined and will give very long-range chases, so you must be prepared to follow them. Because they are so determined, Cooper’s Hawks have been killed flying into windows and fences in mid-chase. They are usually taken from the nest at about two weeks of age and are allowed to find hidden game in order to dissociate the falconer from prey. Wild caught birds are also preferred since they have hunting experience and may be hooded. 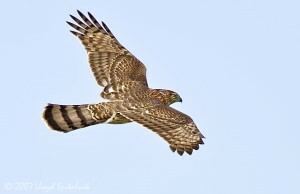 In fact, Cooper’s Hawks may be best used hooded until they are close to the game in order to avoid long chases. Once they find prey, Cooper’s Hawks are practically unstoppable. They may be prone to bating and broken feathers. Cooper’s Hawks reach nesting grounds in March and males will defend a chosen space of about 100 meters. They will court and feed females who wander into the area, although both sexes will perform courtship flights. Although pairs often use the same area for nesting each year, they will usually choose a different site.The site choice and nest building are both affected by the male, though female Cooper’s Hawks will repair previously used nests if such a site is used. Cooper’s Hawks continue to mate during nest building and egg laying, although they stop after four or five eggs are laid. Usually, one is laid every one or two days and they incubate for about 36 days. The male feeds the female during this time. Female Cooper’s Hawks are attentive mothers and will assist the young in hatching. She remains at the nest until her hatchlings are about two weeks of age, at which point she will begin to leave. By three weeks of age she is frequently absent and the male hunts almost constantly to provide the young with food. By 30 days of age, male Cooper’s Hawks leave the nest and females follow around 34 days of age. They must return to the nest for feeding but by eight weeks of age will become independent as they begin to hunt for themselves.